Unquiet Women : From The Dusk Of The Roman Empire To The Dawn Of The Enlightenment - ubiq bookshop: the best place to buy books! In a fascinating journey of rediscovery, Max Adams brings to life the forgotten experiences - and voices - of some of the most extraordinary women in history. Wynflad was an Anglo-Saxon noblewoman who owned male slaves and badger-skin gowns; Egeria a Gaulish nun who toured the Holy Land as the Roman Empire was collapsing; Gudfrid an Icelandic explorer and the first woman to give birth to a European child on American soil; Mary Astell a philosopher who out-thought John Locke. 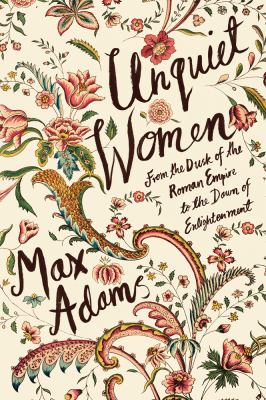 In this exploration of some of remarkable - but little-known - women living between between the last days of Rome and the Enlightenment, Max Adams overturns the idea that women of this period were either queens, nuns or invisible. In a sequence of chronological chapters, a centrepiece biographical sketch is complemented by thematically linked stories of other women of the time. A multi-faceted and beautifully illustrated study of women's intellect, influence and creativity, Unquiet Women brings to life the experiences of women whose voices are barely heard and whose stories are rarely told.